You never truly know how dangerous tables and low-lying cabinets can be until you have a small baby at home. Babies are constantly on the move and, no matter how overprotective a parent you may be, there will be times when you cannot look after them and watch their every move. The sharp corners and edges of a table can pose a hazard to them which is why there a huge need to use baby safety products to smoothen out these surfaces. Sure, some parents would argue that using a baby proof kit at home is useless as you are supposed to allow your kid to judge right from wrong. However, as new parents, we cannot help but feel panicky thinking about all the coffee tables with pointed edges inside the living room. Babies will get bruised and cut no matter what but it gives everyone some peace of mind knowing that the harm inflicted is not in its worst form. So, what does a parent do? Shop for table corner protectors and a table bumper for baby, of course! Some parents go for the DIY route and cover their table edges with foam and pool noodles but this is often not enough. When not done right, it can fall off anytime and may just pose more harm to your baby. If you want hassle-free installation, why not go for the ready-made foam corners and corner bumpers instead? And, to make your shopping even more worry-free, we have rounded up the best products that will help you keep all the tables and furniture in your living room safe for everyone, especially for your little one. 12.6 x 11.8 x 3.8"
5.7 x 5.4 x 1.7"
5.3 x 1.8 x 3.9"
5.4 x 4.7 x 1.4"
Parents, let’s face it. Not all of us are huge fans of babyproofing our homes especially since many of these products actually ruin the look of our furniture – and our homes, in general – so we would rather avoid them if we have to. Who appreciates having those ugly foam corners on our elegant coffee and dining tables anyway? Then again, we also do not want to be called careless and selfish parents and regret in the end if any avoidable accidents happen so we try to look for products that compromise both our needs and the baby’s and that’s where The Hamptons Baby’s products come in. What we love about these table corner protectors is that it comes with such a modern design that you probably would not mind using these on all the tables you can find in your home, even if it no longer poses a huge safety risk on your baby. We love that this item does not come with ugly foam – it has a clear design so it definitely is not an eye sore. Plus, you can use it on many types of surfaces including glass, wood, plastic, metal, tile or stone. The installation process is quite simple and you can be assured that it stays strong and durable enough to remain where it should; yet the removal process remains just as easy. In case any adhesive sticks to the furniture, simply roll it off and use some furniture polish to clean it up. Even better news is that this product can be used not just to babyproof your home but also to protect other surfaces from getting scratched. If you ever have to move furniture from one place to another, simply put this on so you do not have to worry about scratching surfaces or making holes. There is no doubt about it, this product holds a special place in our hearts and in many other parents’. We are clearly placing this one right at the top spot in our list. When it comes to edge and corner guards, one of the things that parents look into aside from the quality and functionality is the aesthetics. Sure, we want them to be able to protect both our babies and furniture first but we would like them to look beautiful as much as possible, preferable with a design that does not clash with the current theme of the house. What we like about this set of table corner guards from Baby Loovi is that its edge and corner cushions come with a beautiful brown finish that will still make your tables look elegant. It is extra long – 20 feet!!! – and can obviously fit any type or shape of table you have whether it is round, square, rectangle or any other shape. The set also comes with 8 corner cushions (you can at least cover two tables with it) and 40 feet of 3M double-sided tape (that’s a lot to spare!) so you don’t have to go looking for anything else. Aside from the furniture corner protectors, this babyproofing set also comes with a bonus door stopper and electric plug protectors for added protection inside the home. Another reason why you should consider using this edge protector is that it has among the densest cushions available in the market. It is not just perfect for use inside the home but also in other places that can get packed with active kids such as daycares, schools, offices, restaurants, museums and so much more. Parents no longer have to worry about getting bumps and bruises on their kids when they run into hard and sharp corners and edges. Some parents have complained about this product not being able to stick well but it is probably just a matter of installation so make sure to follow the instructions carefully. We would have also loved to see other babyproofing products thrown into the set, such as door knob and faucet covers, to make it a truly complete set. Still, we think this is one of the best thus placing it at second spot. For parents looking for a no fuss, no nonsense set of rubber corner protectors, this is the best product to use at home. You probably love the corner guards that come in clear modern designs but when you are opting for a classic look inside your home, you would probably want something that is not really fancy but still does its jobs. These furniture corner guards come in a brown color and just basically does the job that it is intended for: cover the corners and prevent your little ones from getting bruises and cuts if they ever come in contact with these sharp areas. This product is super easy to install as it already comes pre-installed with 3M double-sided adhesive tapes. All you have to do is peel off the tape backing and place the guard at the desired corner then you are good to go. With the brand of adhesive tape that it uses, you can be assured that it stays on no matter how hard your little ones try to take them off. It is also able to stick to most surfaces including wood, glass, ceramic and steel. You certainly do not have to look for any other product to cover those sharp corners. 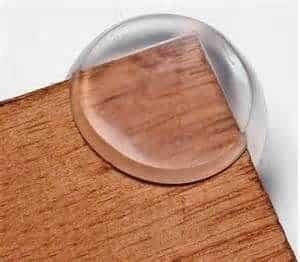 Plus, if you no longer have the need to use these protectors at home, you can remove them just as easily as you installed them and you do not have to worry about ruining your furniture. Another reason why we love these foam corner guards is that it is impact absorbing. It obviously is quite thick which means that in case your little ones come in contact with sharp corners, most of the impact will be taken by these smooth corner guards and protectors. Additionally, this product is non toxic and is naturally fire retardant. It is even lead and phthalate free so even if your child comes in contact with it or even chews and bites on it, you do not have to worry so much as it does not pose a safety risk to them. No wonder this deserves to be placed at the middle of our list. If you have ever wondered how to baby proof coffee tables without going through a complicated installation process, then this product is for you. It super simple – you can protect your coffee table (or even more) in just less than two minutes and it won’t even ruin the look of your furniture! Why is it one of the best and most trusted table corner protectors available in the market? There are many reasons why. For starters, we love the easy installation process that this product comes with. All you have to do is remove the covering from the extra-hold adhesives that have been pre-applied at the factory, stick it on the table’s edge and it should be good to go. Your little ones will not be able to remove them very easily but when time comes when you no longer need it, the removal process is still quite simple. We also love that these protectors are tiny so they are nearly negligible on your coffee tables once you install them. One of the worries parents have about babyproofing their home is ruining the overall look of their house. This one comes in a clear, small design so it definitely will not get in the way of your house’s look and feel. We do have a few words of warning when using these corner protectors for furniture though. First, make sure to do a triple check on its proper installation so it does not really come off; these items are small and can pose a choking hazard for your kiddos. Of course, keep the extra corner guards out of the reach of small children to prevent accidents from happening. Also, avoid using them on high gloss tables as they tend to be useless and can come off really easy. Other than that, we believe that these really work and serve their purpose well so we are placing them at the fourth spot in our list. When it comes to childproofing products, one of the first things that you should consider getting for your home are corner covers such as this one bumper strip and corner guard set. Why do we love this product? There are many reasons why. Obviously, its ability to protect babies from sharp table corners and edges is one of the biggest reasons. But, beyond that, we also love that it is able to do a whole lot more. Not only does it protect your little ones from getting bumps and bruises, the PVC material also helps protect your furniture from scratches and damages, unlike the regular foam covers. The back side of the package comes with a strong adhesive that can easily stick to furniture and yet is still very easy to remove and does not ruin the beauty and value of your tables. With its more than six feet length, it is also able to protect even your longest tables. If you are planning to use it as a coffee table protector then you can use it on several tables and not have to buy another set unless you have to. It is definitely economical and easy on the budget. It also does not emit any foul odor so you know that it is safe to use around the house even with your little one around. Perhaps the main reason why many parents do not quite love this product is that it usually does not cover the thickness of the table corners. Since it leaves behind a little lip, it is still possible for your baby to bump their head on it. Some do love the design of the edge covers as they look better when used on glass tables so that is a plus. However, after considering all the pros and cons, we believe that this one deserves to be placed at the bottom spot. There is really no true secret to choosing the perfect rubber corner bumpers and plastic corner guards for furniture. Sure, parents will look into quality and aesthetics but to make sure that it can withstand months or even years of use and abuse, the right adhesive tape and proper installation procedures need to be followed. If you have to use a backup double-sided tape to do the job then, by all means, do so. It will be a bit of a hassle at the start but at least you know that your little ones will never be able to take it off and that they will continue to be protected from hard and sharp corners and edges in the months and years to come. For more babyproofing products, also check out our Best Baby Safety Gates and Best Electric Outlet Covers.